Stapedectomy is a surgical procedure in which the innermost bone (stapes) of the three bones (the stapes, the incus, and the malleus) of the middle ear is removed, and replaced with a small plastic tube of stainless-steel wire (a prosthesis) to improve the movement of sound to the inner ear. 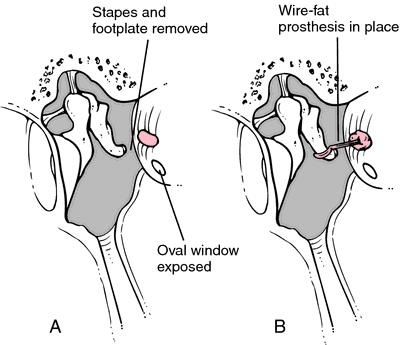 A stapedectomy is used to treat progressive hearing loss caused by otosclerosis, a condition in which spongy bone hardens around the base of the stapes. This condition fixes the stapes to the opening of the inner ear, so that the stapes no longer vibrates properly; therefore, the transmission of sound to the inner ear is disrupted. Untreated otosclerosis eventually results in total deafness, usually in both ears. With the patient under local or general anesthesia, the surgeon opens the ear canal and folds the eardrum forward. Using an operating microscope, the surgeon is able to see the structures in detail, and evaluates the bones of hearing (ossicles) to confirm the diagnosis of otosclerosis. Next, the surgeon separates the stapes from the incus; freed from the stapes, the incus and malleus bones can now move when pressed. A laser (or other tiny instrument) vaporizes the tendon and arch of the stapes bone, which is then removed from the middle ear. Good candidates for the surgery are those who have a fixed stapes from otosclerosis, and a conductive hearing loss at least 20 dB. Patients with a severe hearing loss might still benefit from a stapedectomy, if only to improve their hearing to the point where a hearing aid can be of help. The procedure can improve hearing in more than 90% of cases. Prior to admission to the hospital, the patient will be given a hearing test to measure the degree of deafness, and a full ear, nose, and throat exam. Most surgeons prefer to use general anesthesia; in this case, an injection will be given to the patient before surgery. The patient is usually discharged the morning after surgery. Antibiotics are given up to five days after surgery to prevent infection; packing and sutures are removed about a week after surgery. The most serious risk is an increased hearing loss, which occurs in about one percent of patients. Because of this risk, a stapedectomy is usually performed on only one ear at a time. Severe dizziness or vertigo may be a signal that there has been an incomplete seal between the fluids of the middle and inner ear. If this is the case, the patient needs immediate bed rest, an exam by the ear surgeon, and (rarely) an operation to reopen the eardrum to check the prosthesis. About 90% of patients will have a completely successful surgery, with markedly improved hearing. In 8% of cases, hearing improves, but not quite as patients usually expect. About half the patients who had ringing in the ears (tinnitus) before surgery will have significant relief within six weeks after the procedure. American Academy of Otolaryngology-Head and Neck Surgery, Inc. One Prince St., Alexandria VA 22314-3357. (703) 836-4444. http://www.entnet.org. Cochlea — The hearing part of the inner ear. This snail-shaped structure contains fluid and thousands of microscopic hair cells tuned to various frequencies, in addition to the organ of Corti (the receptor for hearing). Conductive hearing loss — A type of medically treatable hearing loss in which the inner ear is usually normal, but there are specific problems in the middle or outer ears that prevent sound from getting to the inner ear in a normal way. Incus — The middle of the three bones of the middle ear. It is also known as the "anvil." Malleus — One of the three bones of the middle ear. It is also known as the "hammer." Ossicles — The three small bones of the middle ear: the malleus (hammer), the incus (anvil) and the stapes (stirrup). These bones help carry sound from the eardrum to the inner ear. Vertigo — A feeling of dizziness together with a sensation of movement and a feeling of rotating in space. surgical removal of the stapes, which is then replaced with a prosthetic device composed of stainless steel, Teflon, or a similar substance. This is done for relief of deafness produced by otosclerosis (fixation of the minute bones of the middle ear). Replacement of the fixed stapes with a device capable of vibrating permits transmission of sound waves from the outer ear to the inner ear so that hearing is restored. Because the stapes is one of the smallest bones in the body, this procedure is delicate and must be performed under an operating microscope. Very fine instruments are used, designed specifically for this procedure. Patient Care. The procedure is done under local anesthesia and the patient usually can go home on the first postoperative day. vertigo (dizziness) is common following stapedectomy but it is only temporary. The patient must be protected from falls and self-injury until the sense of balance is regained. Care must also be taken to prevent infection and the patient must be cautioned against blowing the nose and getting water in the ear while bathing until the operative site is completely healed. Stapedectomy to correct hearing loss caused by otosclerosis. A, Middle ear tissue has been removed. B, Prosthesis is in place. 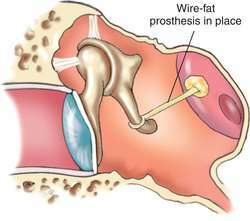 Operation to remove the stapes in whole or in part with replacement of the stapes by a metal or plastic prosthesis; used for otosclerosis with stapes fixation to overcome a conductive hearing loss. /sta·pe·dec·to·my/ (sta″pĭ-dek´tah-me) excision of the stapes. Surgical removal of the stapes. the removal of the stapes of the middle ear and insertion of a graft and prosthesis, performed to restore hearing in cases of otosclerosis. The stapes that has become fixed is replaced so that vibrations again transmit sound waves through the oval window to the fluid of the inner ear. The stapes is removed and the opening into the inner ear is covered with a graft of body tissue. One end of a small plastic tube or piece of stainless steel wire is attached to the graft. The other end is attached to the two remaining bones of the middle ear, the malleus and the incus. Headache and dizziness are expected early in the postoperative period. The patient's hearing does not improve until the edema subsides and the packing is removed. Possible complications include infection of the outer, middle, or inner ear; displacement or rejection of the graft or the prosthesis; and leaking of perilymph around the prosthesis into the middle ear, with ringing in the ear and dizziness. Compare incudectomy. Operation to remove the stapes footplate in whole or part with replacement of the stapes superstructure (crura) by metal or plastic prosthesis; used for otosclerosis with stapes fixation to overcome a conductive hearing loss. An operation to relieve the deafness caused by OTOSCLEROSIS. From the intragroup analysis, we found a statistically significant difference between pre- and postoperative values for all three measurements in patients who had undergone a total stapedectomy and placement of a prosthesis (a reduction in air-conduction and ABG values and an increase in bone-conduction values). Both stapedectomy and stapedotomy give excellent results for surgical treatment of otosclerosis. Patients in Group B underwent stapedectomy in which two third of stapes footplate was removed and prosthesis placed with interposition of Teflon piston as in stapedotomy. The Laser stapedectomy is a procedure which permits the surgeon to operate without touching the stapes. Among patients who undergo revision stapedectomy, the incidence of reported SHL is greater than that of sudden sensorineural hearing loss; also, the onset of SHL is more rapid than that of gradually progressive cochlear otosclerosis. More important, he expressed interest in the possibility of surgical treatment of the otosclerosis in his right ear, which would be possible only if he gained sufficient hearing in his deaf left ear to accept the small risk of deafness associated with stapedectomy surgery in his right hearing ear. Greater footplate thickness in stapedectomy requires greater surgical skills. 1-3) These finding are in contrast to those found when examining taste disturbance after stapedectomy, in which cutting of the nerve was found to cause significantly greater symptoms than manipulation alone. 2) These patients were treated by stapedotomy or partial stapedectomy. A 56-year-old man presented with left otalgia and otorrhea 5 weeks after right (contralateral) total stapedectomy with oval window graft, tympanoplasty, and myringotomy tube placement. Technical refinements and precautions during ionomeric cement reconstruction of incus erosion during revision stapedectomy. Delayed facial palsy following uncomplicated stapedectomy.